Shahid Kapoor Colgate Max Fresh |Know how Max Fresh Stars wake up! Colgate Max Fresh |Know how Max Fresh Stars wake up! Switch on the Power of Freshness Powered by Colgate Max Fresh brings us together to wake up and energize your cricketers during your favourite matches. You are not alone! Genelia D'Souza and Shahid Kapoor will be our official Freshness Mascots who will help you energize our cricketers. For beginners let's wake up Sehwag, Gambhir or Zaheer! What's more? Participate in our Colgate Max Fresh Alarm Contest and get a chance to meet them. Mumbai. Money to run after the big star of the film industry often seems to Parafaerm weddings and parties are, but Bollywood actor Shahid Kapur is not included in the cast list. According to reports, Shahid Kapoor appeared in a newspaper Alkshaminivass Mittal's wife's birthday party refused to dance. The Performance of the transverse offers them 15 million. Who is India's sexiest bachelor? Shahid Kappor Salman Khan or Rahul Gandhi? Who is India's sexiest bachelor? Who is India's sexiest bachelor? A new TV show will reveal the answer after the public casts its votes from a panel which could include Rahul Gandhi, Ranbir Kapoor, Shahid Kapoor and Salman Khan. The show is being brought on the small screen by Reliance Broadcast Network's BIG CBS PRIME, 92.7 BIG FM and BIG MAGIC. The winner will be selected on the basis of public voting and the opinion of a jury, which is expected to include three leading ladies from tinsel town. According to a source, the channel has approached actresses like Preity Zinta, Katrina Kaif, Urmila Matondkar and Sophie Choudhary to be on the judging panel. BIG CBS PRIME will shortlist the top contenders with the help of the jury members, and five out of the top 10 contenders will compete for the ultimate title. Mumbai: Guess who has been spotted with Shahid Kapoor off late? It’s none other than pretty actress Genelia D’Souza. Now before you guys jump to any sort of conclusion, the duo have been friends from the days of ‘Chance Pe Dance’ and have been in good terms ever since then. According to sources, Genelia nowadays is playing the good friend and lending her shoulder to heartbroken Shahid. Everyone has a way of dealing with heart-break. While some like being lonesome, some need their family and Shahid just likes hanging out with friends. The duo have been spotted at many places together having a good time together. And Genelia is playing the good friend and giving Shahid friendly advice whenever needed. So, all the ladies who were worried about a heartbroken Sasha can now be assured that he is in good hands. Right Shahid? Did Katrina Kaif approach Shahid Kapur's dad for Mausam? Actress Katrina Kaif’s kitty may be bulging with interesting projects, but seems like the actress did miss out on one film that she was initially rather interested in doing. Or at least that’s what the buzz doing the rounds in B-Town claim. The film in question happens to be veteran actor Pankaj Kapur’s directorial venture Mausam and the role eventually went to actress Sonam Kapoor. The flick that also stars actor Shahid Kapoor is now almost nearing completion. However, insiders claim that it was Kaif who was initially keen to play Shahid’s love interest, much before Kapoor was even cast in the film. In fact, the source even insist that the star had sent several messages to Shahid and dad Pankaj indicating an interest in the film. “Katrina had sent out a few messages showing an interest in the film. She had even approached Kapur on several occasions to cast her in his directorial debut. However, due to certain reasons, it could not be taken further and Sonam was cast instead,” said the source. Interestingly, sources close to Kaif have a different story to tell. A close friend of the star insists that in fact it was Kaif who was first approached for the role. “The filmmakers had approached Katrina, but without a bound script. They wanted to know if Kat could give them bulk dates, but without reading the script she refused to make any commitment. Besides, it was impossible to give away those dates as they were already allocated to other projects,” says the source. “Katrina still has great respect for the director and would love to work with him someday provided she knows what her role will be,” the source added. Apparently, during the casting of the film, Kaif was already being considered a strong contender for Kapoor’s role with buzz about the how the pair would look on screen being discussed as well. However, the role landed in Kapoor’s lap. Incidentally, Kapoor and Kaif are said to not get along too well either, thanks to their common good friend Ranbir Kapoor. The enormously popular model-turned-actor Shahid Kapoor stars in an adorable new ad campaign for People for the Ethical Treatment of Animals (PETA) India extolling one of the many benefits of a plant-based diet: "Chicks Love a Vegetarian". The ad, shot by ace photographer Atul Kasbekar, shows a casually dressed Kapoor with two downy yellow chicks perched on his body. 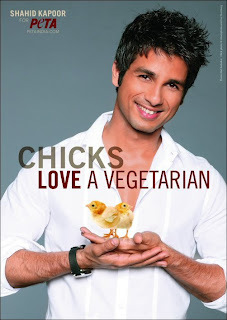 Kapoor says, "I love chicks… pigs, cows, fish, and all the other animals too. That's why I turned vegetarian." Kapoor who won PETA India's Sexiest Vegetarian contest in 2009 received the 2003 Filmfare Award for a debut film for his appearance in his Ishq Vishk. His recent films - Jab We Met, Kaminey, Badmaash Company, and Paathshaala - have all been hits. In India, animals who are killed for food are crammed into vehicles for slaughter in such high numbers that many animals break their bones, suffocate or die en route. At abattoirs, workers often hack at the throats of goats, sheep and other animals with dull blades. Millions of chickens spend their entire lives in huge factory warehouses packed together so closely in tiny battery cages they cannot even stretch a wing. They stand in their own accumulated waste, which reeks of ammonia. The birds never see the light of day and are denied everything that is natural and important to them. Meat production is also disastrous for the environment. Senior UN Food and Agriculture Organisation official Henning Steinfeld stated that the meat industry is "one of the most significant contributors to today's most serious environmental problems". Nitrous oxide is about 300 times more potent as a global-warming gas than carbon dioxide. According to the UN, the meat, egg and dairy industries account for 65 per cent of worldwide nitrous-oxide emissions. What's more is that India has one of the highest rates of heart disease and diabetes in the world. Studies show that consumption of animal products is directly connected to cardiovascular disease, stroke, certain cancers, obesity and diabetes. For this reason alone, millions of people choose to go vegetarian. "I am very happy being a vegetarian and I believe that it is the best way to be," says Kapoor. "The day I started believing in the fact that I would want not to kill animals for my taste buds that is the day everything changed for me." Born in: Chandigarh, "in a hospital delivery room…"
Vital Stats: (my) "Heart is beating." Studied: Vivek Highschool (till the 7th grade), Woodstock Boarding School (8th grade onwards). College: "The University of Life!". First Job: Did a lot of household chores for her family, typed letters for her mom for cash, washed cars, walked dogs etc. One Secret: She's a good baker. In Chandigarh, she used to love to bake muffins, cakes etc and give them to people. People know you from Roadies Season 4. How did you end up Veejaying for MTV? t just happened. After Roadies was over, I used to do a lot of events for MTV. And they saw me getting better at it. At the time, I was applying to college in New Zealand. I was going to go away to study Graphic Design for 5 years. I wanted to be an artist. But then Mtv happened. And what did you want to be as a child? Mostly, I wanted to be an adult. We were very aware of the financial situation we were in, and I just wanted to earn enough money and support myself. Now that I'm an adult, I want to be a child! A lot of the boys want to know if you're seeing anyone? No man, I wish. I just don't have the time. So what is your idea of the perfect man? A dog! No, I'm kidding. He has to love paneer, because I loveeee paneer. And he has to go to the gym. And also, not make a big deal of the fact that I like to eat healthy. Do you work out a lot? Everyday! For about an hour to and hour and a half. I have immense willpower, it's very strong. I don't drink, don't smoke, don't do drugs. I think there are cooler ways to die. Your hair always looks really great. How often do you colour it? I can't even remember. I just love color in everything….and I think the uncombed look is a great fashion statement. 9…but my favorite are my truth and karma tattoos. I think it's almost missing the trains and flights when I am with my mum and sister. Who matters the most to you in your life? My grandfather, but he passed away. I used to. Then I grew up. So, now I don't anymore. Do you support any social causes? I would support PETA, but I eat fish. But, I have been donating blood 6 times a year since I turned 18. As reported ('Spotted: Shahid and Bani together'; Hitlist, April 5), the actor is upset that he is being linked to VJ Bani! The actor feels it's Bani's pals who are spreading the buzz. Says a source close to the star, "Shahid and Bani have a common trainer Abbas. They have just met a few times!" The source adds that Shahid is busy cozying up to Priyanka Chopra again to woo anyone else. "Beyond his shooting for Mausam, watching cricket and giving PC bike rides, he has no time for anyone else!" Pssst... Shasha won't react to buzz on his relationship with PC, but is all up in arms when paired with a veejay! About ten years ago if you had met Shahid Kapoor, he would've come across as funny, strange or even skinny. It's 2011. Today he might still be questioning why women find him so attractive. So as I type few of my last tweets before heading to his Andheri residence, I immediately get girls hooked on, sending their wishes and messages. Doesn't that describe the actor's mad fan following? There's no denying he's earned it the hard way. In person, Shahid looks every inch the movie star; a toned, somewhat rangy alpha male who parries questions with an easy twang. And yet on screen, there can be something low-key, even anonymous, about him. Kaminey is a film which many of his well wishers think is one act he will find difficult to surpass. What they don't realize is that the film was just the start of there being madness in method acting. But the actor is too fast to answer, "They haven't seen Mausam". Waiting for me in his apartment, Shahid looked relaxed in his dark blue chequered shirt and denims. His stubble made him look as if he's just returned from a prison break and his attitude made him look one hell of an actor who steals the show, come what may. Is this early interview an indication of Shahid Kapoor's soon-to-come mesmeric performance in Mausam? Whatever the answer, Shahid Kapoor is raring to steal the scenes. So over a cup of black coffee on a pleasant Sunday afternoon, UK's Harrow Observer columnist and Bollywood Hungama's London correspondent met up with the uncanny and unstoppable Shahid Kapoor. Presenting the 'exclusive first' of the two part special only on Bollywood Hungama. "My father waited six months for me to complete other projects because I had to give my heart and soul to Mausam"
Mausam does require complete dedication and that's why I was told by my father, the director of the film too, to give my heart and soul to Mausam as the principal characters, played by me and Sonam travel twelve years through the film. He very specifically told me, 'I don't want you to do anything else in between while shooting for Mausam'. He waited six months for me to complete other projects and then decided to start the shoot. "Air Force Pilot is one of the four looks I have in Mausam"
I have four different looks in the film and my first look of an air force pilot is just one of them. It will be wrong if I say that I cannot surpass any of my previous performances, especially Kaminey. All characters I portray in films are different and cannot be compared. There are lot of films I've done and some performances that are very close to my heart. Mausam is again a special film for me. How successful it is, time will tell. We've tried to keep Mausam as commercial as it should be because it is an expensive film and has taken a year of my life. Yes, it will be released on a large scale. "Our biggest struggle is that we have an extremely varied audience"
Hollywood has mastered the art of making great films that can connect with any audience. We still need to learn that. We can work harder. Our biggest struggle is that we have an extremely varied audience. A country like the US speaks the same language, there isn't any cultural difference. India has so much cultural variety and so many languages, that it becomes difficult for us to cater to each one of them. That is why the word commercial means something that can connect to the entire nation. "The biggest hits in our country have been love stories"
Love is a universal emotion and that's why the biggest hits in our country have been love stories. It connects to one and all. National pride too is a universal emotion. That's why you will see films like Lagaan, Rang De Basanti and Chak De Indiawork. We just need to learn the art of how to do it. There are few people who have learnt that art and are successful today in our industry. "Mausam starts in 1992 and ends in 2003"
Mausam starts in 1992 and ends in 2003. It is spread over twelve years and it is not a period film. The agenda to release the first look quite early was because of many reasons. I play an air force officer and we never wanted to confuse the audience that it's a war film. It is a love story. The love story starts when the boy and girl are seventeen years of age and it goes on till they are in their thirties. You will see an adolescent and a mature love story too. Priyanka Chopra Shahid Kapoor after Brekaape many hot spots are beginning to appear. With VJ Bani recently they appeared at Bandra was a Netspugo. According to those present with Shahid and his friend had had with his promoter. It also took quite a while dinner three are waiting. The three then went from there as well. After Priyanka Shahid Berakaape are spending more time with your friends. When they were with Priyanka were out with someone. Now if they are single and are taking full advantage of it.Bani says I was eating out with Shahid. We go to the gym. After the workout with us very hungry, so we thought of eating. Now this may Shahid told Bani that this is the beginning of a new relationship or not.